​from the book so feel free to read! I hope you enjoy both! Yes, my favorite flower is The Funeral Flower. My first memory of my favorite flower is ironically (maybe not so ironically) at a funeral. I was 10 years old and having my first experience with death; the passing of one of my most favorite people in the world, my grandfather. I really didn’t know anything about death or loss before then, not personally anyway. When I was 8 years old I had a dog that “went to a better home” and I missed him terribly. However at 8 I only knew life, so I pictured little Tiger running in fields and chasing birds at his new home and got over it quickly. My grandfather was a different experience all together. He and I were very close and his dying so suddenly was devastating. I remember the night vividly. The emergency room. Screaming. Saying goodbye. Holding his hand for the last time and realizing it was the first time I gave him more love than he returned. Then the funeral and another first; the first time I saw my Daddy cry. In that moment, behind a curtain that served as a backdrop for the casket, my mom was holding my Dad while he cried. As I began to back away my mind went to a different place. Understanding human behavior better now, I realize that I just needed to find something good. I found flowers, the wonderful smell of flowers. I opened my eyes and just as clear as yesterday I remember tears falling down my cheeks when I walked up to one of the standing sprays of carnations and looked at them. They were white and frilly like lace and smelled incredible. My sister soon came and dragged me away to meet a distant relative I’d never heard of. The day was horrible, except for the flowers. Most people might have had an opposite reaction to carnations that day and never want to see them again. Not me. Carnations are one of my happy places. The few years after my grandfather passed were really difficult for me. I can’t remember much but what I did choose to retain were a few of the good things from the innocent side of my childhood. For example the phenomenal smell of the Sassafras tree in our backyard; to this day when I drink a soda, it’s root beer. Another is the little boy who befriended me through the fence between our backyard and his grandmothers; I will always remember him. For that matter his grandmother too, she always served hot chocolate and cookies for Halloween. Unfortunately, I don’t recall smelling or seeing another carnation until I went to a restaurant years later and there was a small arrangement of red carnations on the table. I often think it was best those years were void of carnations, because they were tough. Moving forward: Even though I love carnations, it never stopped people from trying to inform me that they were the “cheap”, “ugly” flowers used in funerals. One of my favorites: people used to keep the relatives that passed away in their house for days while others traveled from many miles around to pay condolences and the strong smell from carnations would cover up the smell of the decaying body. YEA…thanks for that one. 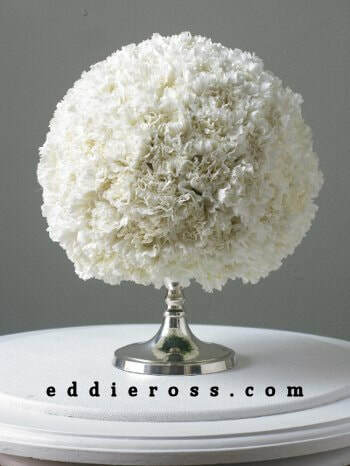 Through the years in my own research I’ve learned some intriguing things about carnations. They are extremely hearty. You can get a bouquet on a Monday and by the end of the week it still looks just as good. One of my favorite types, the variegated carnation, represents regret that a love cannot be shared. How curious is that? Seems to me that would be the carnations you should want at a funeral, the truest symbolism. Interestingly, there is a Christian legend that pink carnations appeared when Jesus was carrying the cross. Everywhere the Virgin Mary’s tears fell, pink carnations sprang from the ground in their place. So, pink carnations are a symbol of a mother’s undying love. ​Needless to say, all the opinions in the world can’t cover up a psyche. A long ago imprinted psyche. For me, Carnations are the good that you find in all the bad. They are fluffy and fragrant. They are frilly and lacey. They are colorful and dynamic. Still…they are the funeral flower; to some people, they always will be. However for me, just like root beer, innocent friendships, hot chocolate, and cookies they will always represent the good. IF YOU ENJOYED READING THIS PLEASE SHARE!